For the first time in decades, the non-marital birth rate in the U.S. has been declining, according to a new report from the National Center for Health Statistics. The rate peaked in 2008 at about 52 babies per 1000 unmarried women of childbearing age, before dropping to 45 births in 2013. Like declines in overall fertility that have occurred since 2007, it’s quite likely that this recent decline in the non-marital birth rate also occurred as a result of the economic recession of 2007-2009. 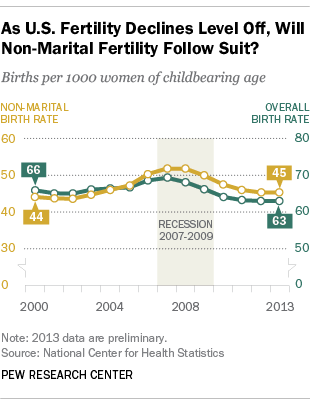 Will the non-marital birth rate continue to drop as the economy slowly recovers? It’s difficult to know, but many experts believe that overall fertility will bounce back as the economy improves, as has been the case with past recessions — and indeed, the sharp fertility declines that occurred during the recession have already begun leveling off, and it appears as though non-marital birth rates may be following the same course. How does the U.S. compare with its European neighbors in terms of the share of births that occur outside of marriage? Overall, the profiles are quite similar. In 2011, 39% of births in the European Union were non-marital births, and in the U.S. that share is 41%. While the averages are similar in the U.S. and Europe, the prevalence of non-marital childbearing varies dramatically across the 28 EU member states. On one hand, a number of countries situated primarily in the north of Europe report relatively high shares of non-marital births. In fact, more than half of all births in Norway, Sweden, Belgium and Denmark now occur outside of marriage. On the other end of the spectrum, Cyprus, Croatia, Macedonia, Greece and Turkey each report that less than 20% of births occur outside of marriage, with the lowest rate — 3% — occurring in Turkey. Like the U.S., just over 40% of births in Finland, Austria and the Czech Republic occur outside of marriage. When compared with countries around the globe in terms of non-marital childbearing, the U.S. still falls near the middle, according to a Pew Research Center analysis of United Nations data: Bahrain, Qatar and Kuwait report that less than 1% of births are to unmarried women, while on the other end of the spectrum, French Guiana reports that 87% of all births occur outside of marriage. While the non-marital birth rate in the U.S. has been declining in recent years, the share of births to unmarried women has held steady in the short-term, and increased dramatically in the longer term. In 1960, some 5% of all births were to unmarried mothers. That number rose to 11% by 1970, and by 1990 it had jumped to 28%. By 2000, the share of births to unmarried mothers was 33%, and since 2008, it has remained at 41%. The long-term increase in the share of births to unmarried women has been caused primarily by two factors: 1) overall increases in the likelihood of an unmarried woman having a baby — the “non-marital birth rate” — and 2) increases in the share of women who are unmarried. Pew Research Center analyses reveal that while in 1960, 72% of all adults were married, by 2010, that share was only about 51%. The fact that birth rates within marriage have declined have also contributed to long-term increases in the share of non-marital births. It’s important to keep in mind that just because a woman has a non-marital birth, that does not necessarily mean that the mother is “going it alone.” For instance, in the U.S., more than half of births that occur outside of marriage are to women who are cohabiting. Though a majority of Americans say the rising share of non-marital births in recent decades is “a change for the worse,” this attitude may be changing, and more Americans than ever before say that having a child outside of marriage is morally acceptable. A 2011 Pew Research survey found that 64% of adults say more people having children without getting married is a change for the worse, while 29% think it hasn’t made much difference, and only 4% say it’s a change for the better. But there is a sharp generational divide with Millennials (ages 18 to 30 in 2011) who are more likely to say that it makes no difference than older generations. Gallup found this year that 58% of American adults say that having a baby outside of marriage is morally acceptable — a notable change from 2002, when fewer than half said the same. Acceptance has remained steady around 60% for the last two years.